The Penang property market is expected to enter a boom cycle as there are signs of a gradual price rise due to land scarcity in prime areas. 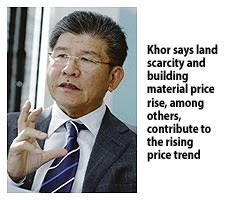 Hunza Properties Bhd (HPB) executive chairman Datuk Khor Teng Tong yesterday said land scarcity, teamed with a hike in building material prices and labour costs, have contributed to this trend. "Going forward, the shortfall in supply of properties cannot be addressed and overcome in the short-term. "This will lead to a situation where supply is unable to meet demand and further contribute to the increasing trend in property prices," he told an analyst briefing in Penang when announcing the company's 2010 fiscal results. For its financial year ended June 30, HPB recorded revenues of RM258.7 million and profit after tax of RM50.9 million. The figures reflect an increase of 172 per cent on revenues and 84 per cent on profit after tax respectively compared with the preceding financial year. HPB benefited from stronger sales in fiscal 2010. "Construction works on the two residential towers of our Gurney Paragon project in Pulau Tikus have also been progressing well, thus contributing to higher revenue and attributable profit on percentage of work done," he added. "It has sped up with its superstructure completed up to its top, the 43rd-storey, and this makes Gurney Paragon the tallest condominium in Penang. "As the demand for high-end property in Penang remains high, we expect a further increase in property price, thus making the outlook for the property market very positive. "Due to these reasons, HPB expects a stronger performance for the 2011 financial year," he added. Gurney Paragon has attracted both local and foreign interest, its developers say, with condominium buyers from 20 countries so far. Of the total 220 units launched, Khor said 130 units with a sales value of RM242 million have been sold as of June 30. The shopping mall is due to start operations in early 2012.